Well, I used to think that it was banal indeed. Everybody knows that breakfast is important and what is a good healthy breakfast, don't they? It is common knowledge, at least in this part of the world. I don't know about the others, so I will not go into that. Different habits around the world, for sure. And then I talked with an Irish guy, who stated that he had started a brand new healthy life. Diet, healthy food, sport. Starting from a healthy breakfast. He even went to a dietetician to have some advice. At that point, I was curious: maybe I have done everything wrong until now and he will enlighten me with some tips that I totally ignored. But then he gave me more details about his new menu for the first meal of the day and...well, it was just common sense. To me. Even more curious, I asked what was his breakfast before: beans (from the can), scrambled eggs, caffelatte and a crispy bacon. And you could see that after two days of "diet" he was already salivating at the memory of the breakfast he had for the past 35 years. At the beginning, I thought that it may be cultural, even if I always distrust statements like "He does like this because he's Irish/Spanish/Italian/Venusian. It's cultural." Culture has an impact, but national culture is difficult to define and anyway not uniform; and we are individuals. By the way, did you already know that I'm Italian? With some Austrian origins, to be precise? Well, now you know. So I believed that, at least in the Italian dimension, the definition of "healthy breakfast" was common knowledge. Let aside the fact that 10% of Italians skip breakfast. But they know they should have it and also what they should eat, for sure. But then I chat with a couple of Italian friends about their eating habits. For breakfast they used to have tea or coffee and then 15 "Macine" biscuits. Now they had changed because the dietetician told them that it was not a balanced and healthy breakfast. 15 macine biscuits? And you need a dietetician to know that??? I have chosen the wrong job, my friends. 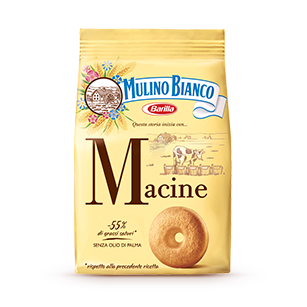 The non-Italians among you may not be familiar with the macine biscuits by Mulino Bianco and may therefore not get my reaction. 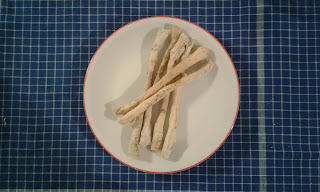 They are delicious biscuits that you cannot resist soaking in your milk or caffelatte. They are very good. On the dark side, the macine biscuits are a heap of calories and fat. If you expected that I would have said "and the terrible palm oil" you will be disappointed. First, because Mulino Bianco says in big characters that the macine biscuits do not contain palm oil. Second, because you, anti-palm-oilists, you won't have me. But it may be the subject for another post. Note to self. Sugar and fat, I was saying. To give you an idea, each macine biscuit contains 63 calories, 9 grams of carbohydrates, 3grams of sugar and 3 grams of fat. I'll make the calculations for you: 15 macine biscuits make 945 calories, 134 grams of carbohydrates, 38 grams of sugar and 39 grams of fat. Don't get me wrong, I am not against sugar, calories, fat etc. Nor am I suggesting that you should feed yourself with roots and water for the rest of your life unless you are the new Prahlad Jani. In that case, I would have some questions about the scientific reliability of your statements about your non-nutrition. I am just saying that there is probably a reason if Mulino Bianco itself states on the Macine biscuits package that the advised quantity for a balanced breakfast is 4 biscuits (with a bowl of milk and some fruit). Not 15, just 4. I hear some of you ranting "Get to the point, for God's sake" and I don't want to bore you further. Just know that before writing this post I was not sure I had something to say about this. You may also wonder when we are getting to the 10 things you should have for breakfast and especially number 7. I have to be honest, I hate that kind of lists. And - sorry to disappoint you - there is no number 7. I just wanted to see the reaction of my lovely husband when he saw the title of this post. He appreciates "10 things that..." articles even more than me, if possible. Before I go into what I have for breakfast, let me add some general remarks about what breakfast should or should not include. It is not only a question of quantity, but also of quality. To have energy, you need carbohydrates, i.e. sugars. 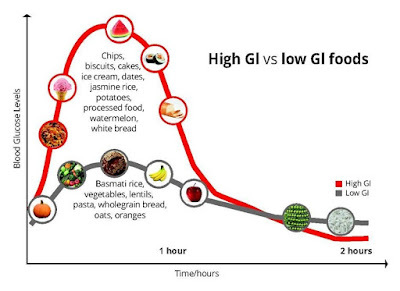 These sugars will increase your glycemic index (GI) to different degrees depending on what you eat. Many elements come into play: not only the ingredients, but also how you cook them, the type of sugar, if they contain fibers... Simplifying it, simple carbohydrates (for example sugar or chocolate) generate a peak of energy in the very short term. That's why athletes like sprinters may get some chocolate or sugary thing just before their short performance. Also other things, but that's illegal. This source of energy runs out quickly. That's why for long performances (marathons, volleyball, tennis) athletes prefer integral cerals (be it bread, pasta, rice) to chocolate bars. 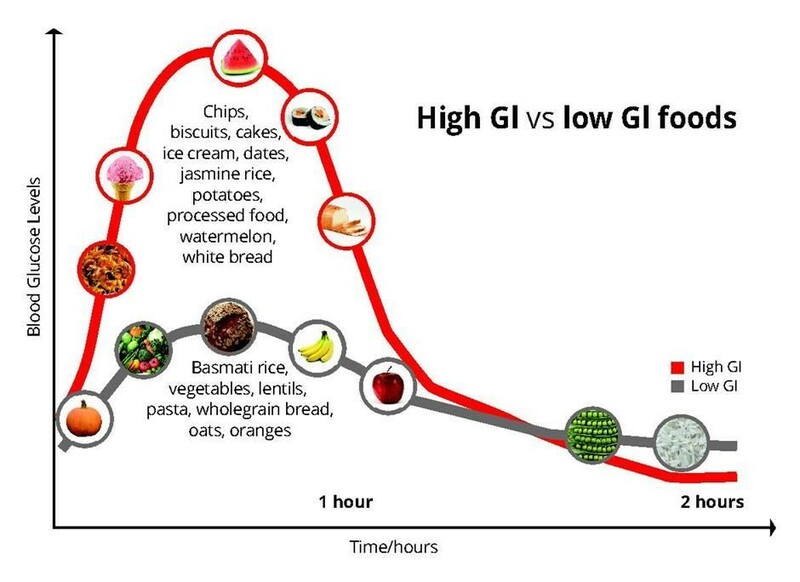 Considering that you will need energy for some hours after breakfast, it's much better not to have a too high peak of energy in the following hour - known as glycemic peak - but rather to take in food which ensures lower GI values for a longer time. In the title I talk about 10 things that you should or at least can have for breakfast. Indeed, there are many more than 10 things that you can choose from, it also depends on what you prefer (but that's a bit of a platitude). Before one of you starts throwing stones at me, I am not a doctor and this is just my point of view, without any presumption of completeness or scientificity. Nonetheless I believe that I have a good food culture and I consider myself rather fit for my age. For what's worth, I have never submitted myself to a diet either. Probably I have never needed to. And anyway I love eating too much and I am not ready to sacrifice one of the pleasures of life. Answer the question @#!$%: what can or should I have for breakfast??? If not 10 things, at least 2! Ok, ok, I am getting there. Coffee is ok. Espresso is better, but just because I'm Italian and I love it. What is important: no sugar at all! First, if you add sugar you will not fully appreciate the flavour of good coffee. Second, these are (sugar) calories that you can avoid. If you find it difficult to give up sugar all of a sudden, do it progressively: from the 5 lumps that you used to put in your coffee, gradually reduce it to 4, then 3 and so on. You can all do the countdown, I guess. In order to help your discipline, find strategies not to find sugar near you, so that sugar means extra effort or time that you don't want to spend. For example, when I started having coffee without sugar, I simply did not keep any in my office, so that I had to go to a colleague or to the cafeteria begging for a lump. Too much effort, I'm lazy. Then, what else. It is not only about how many calories, grams of sugar or fat you have. Or about limiting them close to zero. It is important to have a good intake of calories - ideally 20-25% of your needs for the day - but also a balance of the various nutrition elements. - some superfood. Also known as seeds and berries. At least, that's how I called them before they became super-fashion on food blogs. And this is not a food blog. Now that they are super-fashion, they seem quite expensive too. But probably less than having 15 Macine biscuits a day. Yes, Mulino Bianco biscuits are rather expensive. As I didn't want to enrich the bio-marks of the main supermarket chain in town, I searched a little bit and I found seeds and berries at much more affordable prices at the local discount supermarket or - even better - at the multiethnic quarter of my town. Which is close to my place, lucky me. Probably there are similar things near you too, so don't get stopped by the preposterous prices in the display rack for bio food at the main supermarket. Assuming that I pay around 3-5€ for 200 grams of seeds or berries, and that each can lasts for one month for two persons, I would say that I spend maybe 30 cent per person per breakfast. Just to give a comparison, one macine biscuit costs 8 cent where I leave. If you have 4 as recommended on the package, you already spend the same as I do on seeds and berries. As far as which seeds and berries to choose, you have a wealth of options. At the moment, I have sesame seeds, flax seeds, pumpkin seeds, chia seeds and goji berries. - nuts of any kind. I love nuts, Amazonian nuts and cashews. But almonds or hazelnuts are good options too. How many? There are different opinions on this. With 3-4 you are on the safe side. No more than 7 a day in any case. Same thing than for seeds and berries, I buy them at the local ethnic foodstores, for 12-15€/kg versus 25€/kg at the supermarket. - 2 slices of toasted wholegrain bread with butter and jam or honey. You said butter? Yes, I told you that I am not a taliban of fat and calories. In any case, you should have a balance of all the nutritional elements, proteins included. Occasionally, I give up butter. And also jam. And I replace them with Nutella. Why? First, because Nutella jaaa lahtita (Pardon my bad Sami pronunciation, I am a bit rusty), Nutella is good. 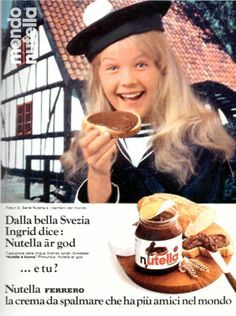 This was a Nutella ad in the '80s, with the picture of a boy or a girl from another country and the Nutella is good in their language. It was published on an Italian comics weekly publication. There was a different ad every week and it was my first approach to languages. I loved languages and I learned these "Nutella is good" in Sami (a dialect from the Laplands), Swedish, Austrian, Peruvian dialects and many others. Later in life I became an interpreter. Chocolate and languages, I had no escape, they got me. Poor naive girl. This one says "From beatiful Sweden Ingrid says Nutella ar god. Then - in small characters and here unreadable - the pronunciation and the Italian translation "Nutella è buona". Bigger: And you? Nutella, the spread with the most friends in the world". Ok, I digressed. Back to what I have for breakfast. - a glass of fruit juice. My favourite are peach and apricot. But any fruit juice will make the deal. Even better, if you have the ingredients at home, a smoothie, which is another cool word for blended raw fruit or vegetables plus some water. Of course, there are many options of what to have. Room for other posts too. And you, what do you have for breakfast?